The cool days of fall have finally arrived and soon the even colder days of winter will be here! As stores quickly sell out of their seasonal fall merchandise, the shelves will begin filling up with holiday décor. Now is the time to prepare for all of your holiday entertaining. We have a wide selection of new Simon Pearce glass and home décor items, perfect for all of your entertaining needs. The Royalton Carafe is made by master glass artisans in the Simon Pearce glass studio. The Royalton carafe can be used to serve your favorite vino as well as serving juices for holiday brunch tables. The Rye Decanter is another piece of Simon Pearce glass barware that is ideal for entertaining. 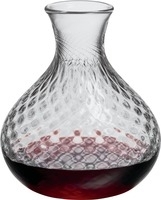 This decanter is perfect for serving your guests bourbon, scotch or whiskey. Pair it with our Rye Whiskey Glasses for a perfect gift for your favorite guy! The Simon Pearce Vermont Evergreen Trees are the perfect glittering holiday home décor. You can choose from a variety of sizes and styles to create you very own forest. 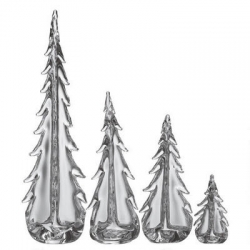 The four inch Vermont Evergreen Tree is the newest addition to the original clear series from Simon Pearce. You can choose from this collection, the Simon Pearce Bubble Vermont Evergreens or the new Simon Pearce Crackle Vermont Evergreen collection of trees. You can create a display with these evergreens surrounded by Simon Pearce votives for sparkling reflections. Add the PURE Vermont Evergreen as a centerpiece and your guests will have plenty to talk about! Pair your evergreen tree display with the Vermont Evergreen Platter. This classic yet fun festive platter is perfect for serving Christmas cookies and will also make for a treasured holiday gift for family and friends. Take the time now to stock up on all of your holiday entertaining pieces from FX Dougherty Home & Gift. We will be hosting a complimentary hand engraving event with Master Engraver, Heidi Cockwill from Simon Pearce in our store October 25th from 5 to 8 pm to personalize your purchases of Simon Pearce glass. Advance orders are welcome. You can place your order and then select the engraving style you would like. Feel free to give us a call at 1800-834-3797 with any questions.